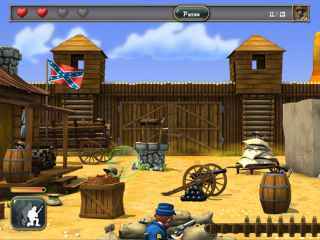 Free Download The Bluecoats: North vs South Game or Get Full Unlimited Game Version! Fight with The Blue Coats during the American Civil War! In order to get advantaged of playing The Bluecoats: North vs South full unlimiteg game version you must register the game. In The Bluecoats: North vs South you play as the head of one of the armies of the Civil War. Your aim is to conquer the American territory. Head up the Yankees or Confederates and destroy your enemy! Taking up positions, capturing states, assaulting and capturing enemy forts, attacking trains and protecting your railroads... you'll have to deal with everything! Capture the port to use the reinforcements coming from Europe. 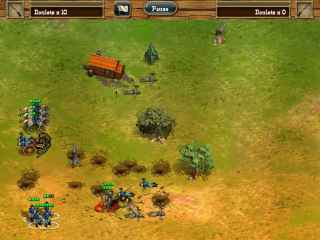 Protect yourself from storms and be wary of ambushes and bandits. To come out in one piece, you'll have to master taking turns, armed battles in real time, 1 against 30 shoot-outs, and horseback train chases in this colorful strategy game!